Last week we made floam. 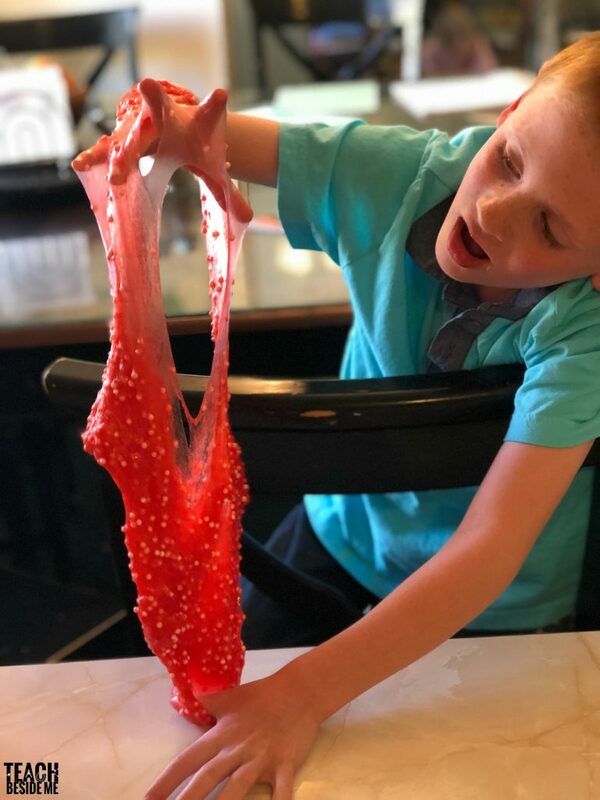 This week, we made edible floam! 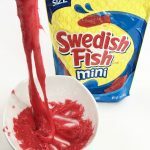 We have found our all-time favorite edible slime. 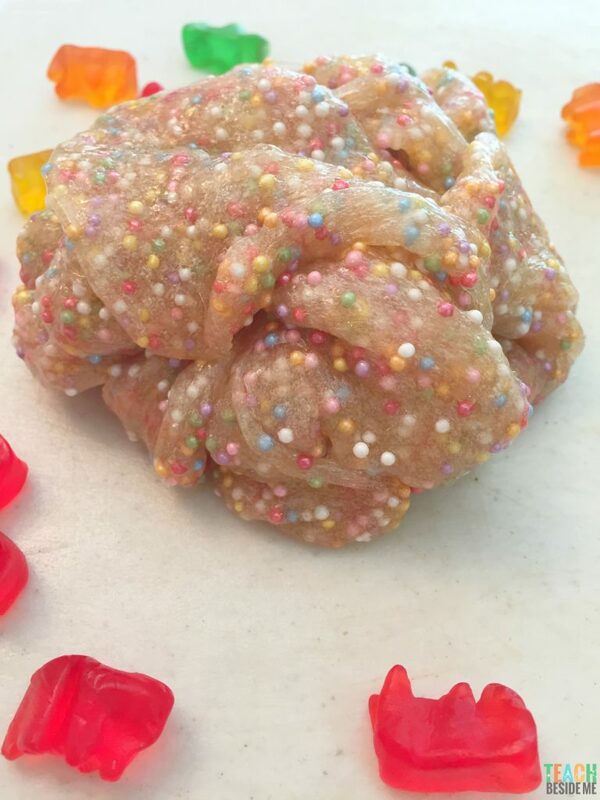 This one is edible gummy bear floam! 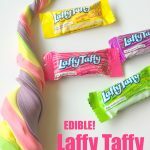 It is super stretchy, has just 2 ingredients, and incredibly delicious! Want to learn how to make it?! You only need 2 ingredients. 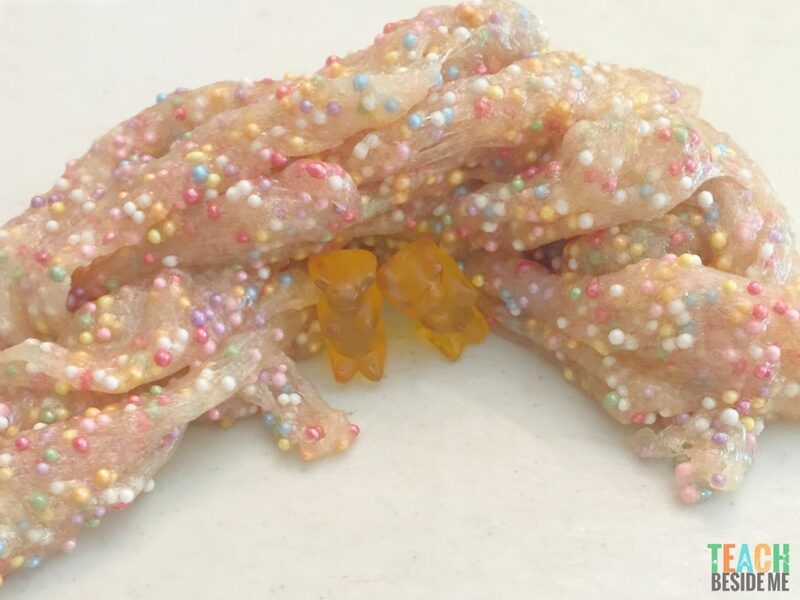 Gummy Bears and Pearl Candy Sprinkles. 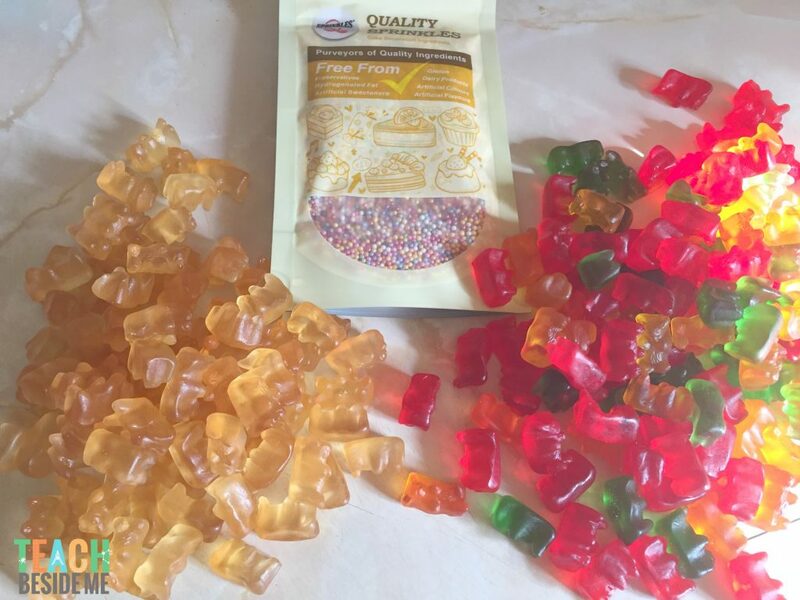 I used only the clear gummy bears for this project, but you can do it with any of the colors. See our red floam at the end! I put my kids to work sorting (and eating a few along the way). I ended up using about 1 cup of clear gummy bears for this recipe, but the amount does not really matter. I put the gummy bears into a microwave safe glass bowl and microwaved for 30 seconds, stirred, then microwaved for another 30 seconds. Stir a few times and let it cool for a minute or two, until no longer boiling. Add in the sprinkles and mix to combine. It is IMMENSELY sticky at this point. 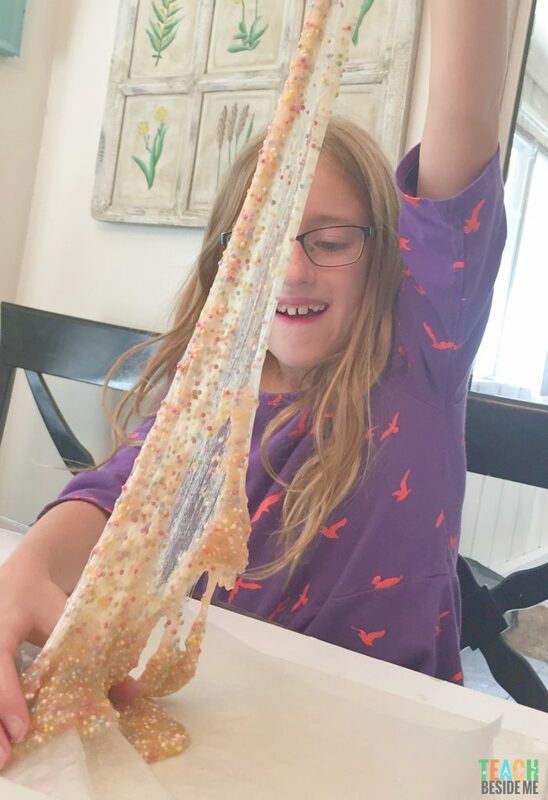 Prepare a large sheet of wax paper. I sprayed it with cooking oil and then dumped the gooey, stretchy substance onto the wax paper. Grease your hands with cooking spray and then it will not stick to you, either. Now it’s ready to play! It stretches tall and wide. My kids stood on a chair and it stretched all the way to the ceiling without breaking! 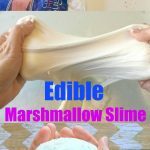 I mentioned that this has been our favorite edible slime to date. It was the most stretchy and the most fun to play with. Plus, gummy bears- SO yummy! 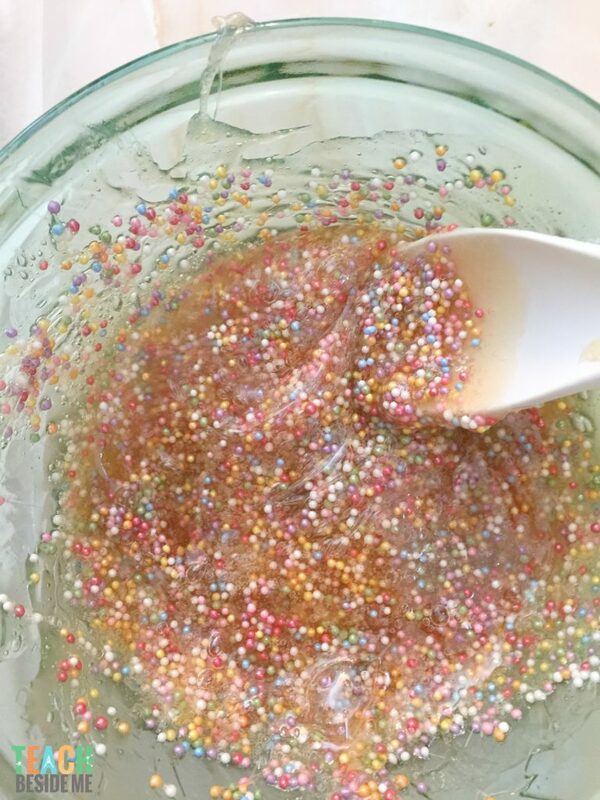 The rainbow sprinkles make it so pretty, but also make it have a fun texture as you play with it. They look just like the little styrofoam balls in regular floam! My son made the floam into a bear cave for the gummy bears! We also tried our edible floam recipe with red gummy bears and white candy pearls! 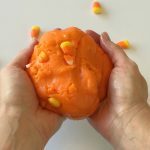 Have you tried my other edible slimes? I love how you made that slime. This was sooooo fun!! Thank you so much for the idea!! My toddler looooved it! Yeah! I am so glad you liked it!! We did, too. Love the idea and want to use it for a birthday party. Does it store well? Does it harden if left alone? It does harden if left for a while. It stays stretchy for about an hour, but can be re-warmed if needed. .